For most of the time that I have worked as a merchandiser for Pepsi, they have relied on the honesty of us merchandisers to report on the hours we have worked and that we have actually been in the stores we are supposed to have worked in. Obviously, this system lends itself to abuse, although I do not think we have had much of a problem in the Seymour area. Still, Pepsi has wanted to implement a more reliable system for some years now, the general idea being some sort of method in which we punch or scan ourselves in, at the various stores, etc. It wasn’t until last month that they finally got around to using such a system. They put up barcodes in each of the stores the merchandisers work in and we scan the codes when we enter or exit the store. The software they decided to use works on an Apple iPhone, and so they gave each of us an iPhone, with an unlimited data plan in order for the software to function correctly. Although these iPhones belong to Pepsi, we have been encouraged to treat them as our own, the only limit being that the plan they adopted only allows 300 minutes for phone calls, so we have been warned against making too many phone calls, and to text message whenever convenient. I suppose this generosity is to encourage us to actually use the phones to scan in and out, etc. I think that Pepsi has made a major mistake here. I now have the equivalent of a library and a home entertainment center in my pocket. I am not sure that such distractions are likely to improve my efficiency at work. 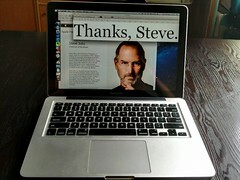 Steve Jobs, the co-founder of Apple died yesterday. There was no cause of death specified, but he had been battling pancreatic cancer. Pancreatic cancer is probably the worst form of cancer to have as it spreads quickly and generally displays no symptoms until it has metastasized. Jobs was only 56 and I would consider that a great tragedy if he had not accomplished more in those 56 years than most of us would if we had lived two lifetimes. Now he has gone on to his eternal reward. Speaking of which, it seems that the Westburo Baptist Church is planning to picket Steve Jobs’s funeral. I am not sure why. It may seem like all of America is sad to hear the news of Apple co-founder Steve Jobs’ death at age 56, but Westboro Baptist Church can find a reason to hate anyone, and Jobs is no exception. Margie Phelps, daughter of rogue church’s pastor Fred Phelps, tweeted their plans to picket Job’s funeral FROM HER IPHONE. She wrote that Jobs went in hell. He served himself and not God, and he taught people to sin, Phelps said. Phelps defended her use of Jobs’ technology, saying “Rebels mad cuz I used iPhone to tell you Steve Jobs is in hell. God created iPhone for that purpose! Baptists usually have a congregationalist organization, meaning that each congregation is independent and not subject to any hierarchy or authority. They do organize in voluntary associations, such as the Southern Baptists, etc but many, including the Westburo Baptist Church, are completely independent. This is unfortunate because this means that no one has the authority to tell the Reverend Phelps and his church to shut up and leave people alone. Of course, I don’t have any such authority either, but I wouldn’t consider them Christians because some of the doctrines they teach are unbiblical. God does not hate anyone. He hates our sins, but that is because He loves us and does not wish us to be harmed by our sins. 7 Dear friends, let us love one another, because love is from God, and everyone who loves has been fathered by God and knows God. 8 The person who does not love does not know God, because God is love. 9 By this the love of God is revealed in us: that God has sent his one and only Son into the world so that we may live through him. 10 In this is love: not that we have loved God, but that he loved us and sent his Son to be the atoning sacrifice for our sins. 11 Dear friends, if God so loved us, then we also ought to love one another. 12 No one has seen God at any time. If we love one another, God resides in us, and his love is perfected in us. 13 By this we know that we reside in God and he in us: in that he has given us of his Spirit. 14 And we have seen and testify that the Father has sent the Son to be the Savior of the world. 15 If anyone confesses that Jesus is the Son of God, God resides in him and he in God. 16 And we have come to know and to believe the love that God has in us. God is love, and the one who resides in love resides in God, and God resides in him. 17 By this love is perfected with us, so that we may have confidence in the day of judgment, because just as Jesus is, so also are we in this world. 18 There is no fear in love, but perfect love drives out fear, because fear has to do with punishment. The one who fears punishment has not been perfected in love. 19 We love because he loved us first. 20 If anyone says “I love God” and yet hates his fellow Christian, he is a liar, because the one who does not love his fellow Christian whom he has seen cannot love God whom he has not seen. 21 And the commandment we have from him is this: that the one who loves God should love his fellow Christian too. (1 John 4:7-20). If they are not acting in a spirit of love, than they are not doing the will of God.